Tucked inside the February British Vogue lives the tropic vision of photographer Tyrone Lebon who casts Damaris Goddrie and Frederikke Sofie to star in his equatorial tale of two rare beauties. Styled by Francesca Burns, the story is dressed in the latest big name spring offerings from Chanel and Prada to Marques Almeida, all finding a fitting home amongst the palms and sunsets of somewhere we’d like to be. The beauty motif is less is more. Hair stylist Syd Hayes double downs with the curls and makeup artist Lauren Parsons downplays with simple accents like a striking red lip when the moment’s right. 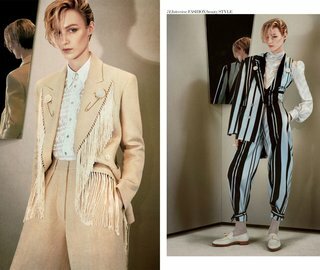 With Lebon’s casually, daring style and the respective efforts of models and team, the fresh visuals are seductive and gorgeous without breaking a sweat.